Watercolor Works: Handiwork - Just for Fun! I work a shift each week at the cooperative gallery with which I am a member. We are encouraged to bring our work and paint and draw during our shift. A few weeks ago I was prepared to paint, but forgot to bring the actual piece I had started, so I looked around for something to work on while I was there. Ah, Ha!!! My hands are attached to me and I cannot forget them! 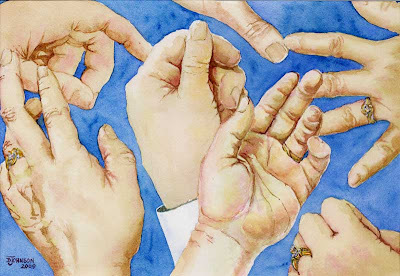 So I sketched my hand several times on a 10 by 14 inch sheet of watercolor paper. I played with wet washes and skin tones. What fun. This is a great way for those of you who want to learn to paint people to study shapes, shadows, values and colors for portraiture. To learn more about the Art and Antique Studio and Fine Art Gallery, a cooperative gallery here in Melbourne, Florida, click here. I am currently gearing up for classes which start the last week in September and I am getting ready to set a date for a one-day Beginner's Watercolor Workshop. If you are interested in classes please visit my website for more information. The one day workshop will cover all the foundational information, wash techniques and brushwork that you will need to begin painting in watercolor. If you would like to participate in the Saturday workshop please drop me an email so I can notify you of the date, time and location. New online lesson coming soon!